Clockwise from bottom: Expedition 54 Commander Alexander Misurkin of Roscosmos; NASA astronauts Mark Vande Hei and Joe Acaba; Roscosmos cosmonaut Anton Shkaplerov; Astronaut Norishige Kanai of the Japan Aerospace Exploration Agency; NASA astronaut Scott Tingle. Three Expedition 54 crew members spent the weekend packing up and preparing to return to Earth Feb. 27. Commander Alexander Misurkin will lead fellow crew members Joe Acaba and Mark Vande Hei back to Earth inside the Soyuz MS-06 spacecraft for a landing in south central Kazakhstan at 9:31 p.m., EST. NASA TV will broadcast live all of the departure activities on Feb. 26 and 27. The Change of Command Ceremony begins Feb. 26 at 2:40 p.m. when Misurkin hands over station control to cosmonaut Anton Shkaplerov. 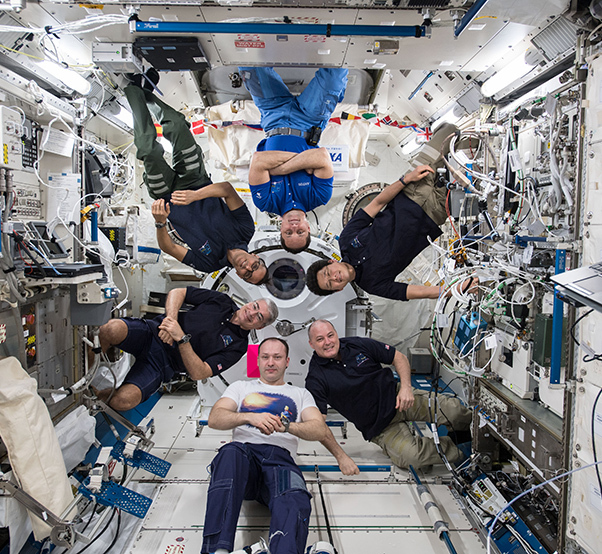 The new commander will stay behind with Flight Engineers Scott Tingle of NASA and Norishige Kanai of the Japan Aerospace Exploration Agency and become Expedition 55 when their crewmates undock the next day. The departing trio will say farewell and close the Soyuz hatch at 2:15 p.m., Feb. 27. They will undock from the Poisk module at 6:08 p.m. signifying the start of Expedition 55 and the end of Expedition 54. Next, the Soyuz engines will fire one last time at 8:38 p.m. sending the crew back into Earth’s atmosphere for a parachuted landing in Kazakhstan at 9:31 p.m.